The October meeting was held in Jack Putnam's shop near Bluffton. There were 9 members present and 1 visitor. Bob Torbet led the short meeting. 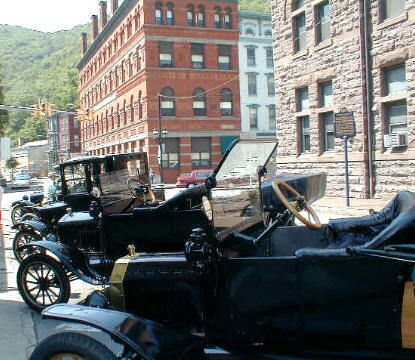 Reports were given on the success of the Ohio Model T Jamboree and some of the recent auctions. Some of the group have been traveling many miles to find goodies to support their Model T habits. 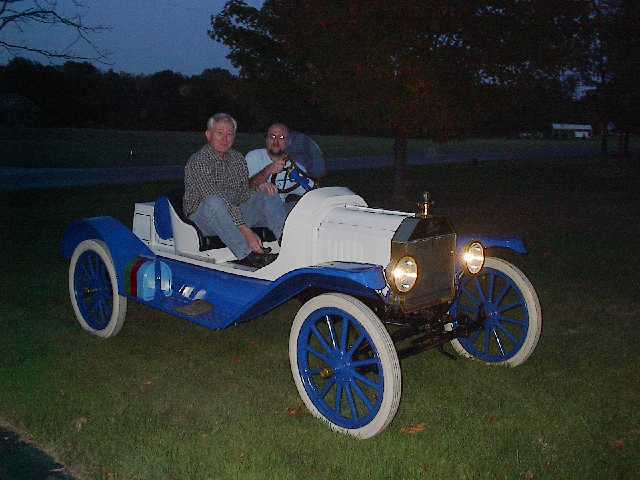 It seems that one of the best buys was at a local home auction in which the only T related Item was a lone 1914 touring. I was bought by a fellow from the Lima area for a fair price. Thanks to everyone who did not attend. It helped keep the bidding down. Please welcome our 25th member, Dennis Moorman of Cridersville. OK; but, please keep him in your thoughts as he goes through this period of adjustment. One of the highlights of the evening was an opportunity to ride in a speedster through the cool night air. Jim is working on this speedster and needed the trial runs to set the play in the transmission and cycle the crud through the radiator. While the transmission drags in neutral, it runs in high gear just fine. Either the clutch fingers need to be adjusted or the plates are digging in. Bill and Jack Show Their "Stuff"
Here we see Bill and Jack working on the upholstery of Jack's 1914. It seems that Bill has been working just a little too long and is up to his ears (or mouth) in stuffing. Sometimes it helps to have a little fun in the middle of one of these jobs; as, it can become quite daunting. Anyone that has tried this activity will tell you that the stuffing over the top of the arm rest is the hardest part. The stuffing can easily settle down the sides and you end up with your arm resting on a hard piece of metal. Of course you do end up with a big bunch of padding right next to your seat if the stuffing does end up settling. There are several tapes from the VCR library that are long overdue. Is it possible that some of them have been set aside and forgotten. Could everyone check their VCR collections to see if you might have one of the clubs tapes. I know that its easy to do. I've done it myself. Just drop it on the table at the next meeting and there'll be no questions asked. This will also give others the opportunity to gain valuable information needed in Model T restoration. Does anyone remember this 1914 Model T touring car that sat all by itself in a garage near Bluffton. Well it was finally auctioned off to the highest bidder. And, that bidder has joined our club. He is very anxious to learn all that he can about what he needs to do to clean this car up and maintain it in runnable condition. Please come to the meetings and share your knowledge. As can be seen from the pictures, this car has had some modification done in the past. Someone has stripped the wheels and steering wheel, some electric has been added. It also has a neat looking lined top. The owner now must decide whether to restore to original or just get it running to drive and enjoy. It is possible to do both. Have a great time with this one. Sometimes, the best way to diagnose a problem with a Model T is to get out and drive it. This T sounded very noisy when it was sitting and idling in the garage; but, out on the road it just purred. Here we see Jim C at the wheel and Bob H along for the ride. This one should be ready for touring by the 2nd week in November. I hope the owner is planning on a trip to Florida. I'd hate to tour in this thing right now!!! 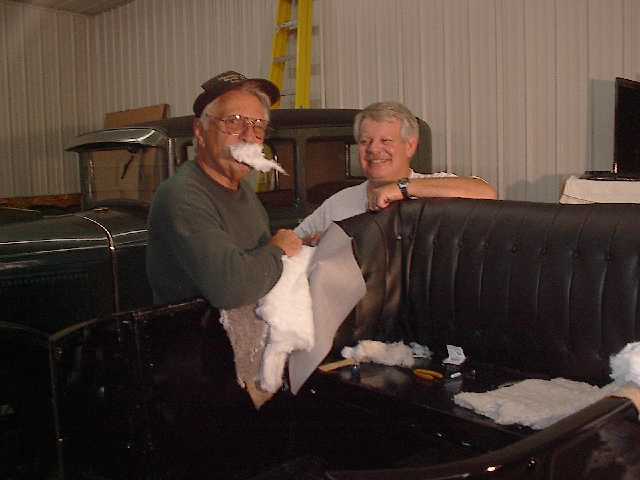 Hap Tucker of Sumpter, South Carolina is undertaking a body study of the different bodies that were used during the beginning of Model T high production. It was prompted by a memo found in the Ford archives that told branches (car dealers) to note the body builder when ordering body panels because of variations between the different builders. Trent Boggess has identified the builders as Beaudette, Fisher, Ford, Kahler, Kelsey, and Wilson. Mr. Tucker would like to know if anyone has one of these bodies 1914 - 1919 and can supply information about the identification markings on the body. 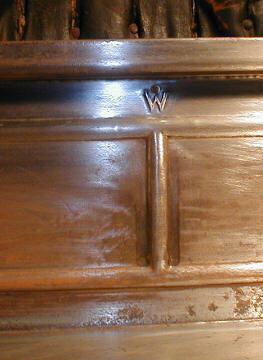 The W for Wilson as seen in the photograph of Old Henry's seat riser is an example. Another example would be a body number somewhere on the car that is proceeded by a letter. Hap can be found on the MTFCI forum; or, you can let Jim Cook pass along the information.